Born in northern of Italy in 1972, Marcello “Captain” Mastrapasqua, began his venture into photography in 1990 working as assistant to several Italian and American fashion photographers. 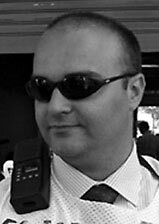 In 1994, Captain emigrated to London where he gained lots of experience working with the most prominent agencies there. He is now based in Milan, Italy, where he collaborates with several web-magazines and shoots portraits of Italian actors and starlets. Marcello says her prefers black & white photography, especially when shooting high contrast using dramatic lighting He currently works with Fuji S3 Pro.